In Single Channel mode, FS-HDR also serves as a full, 1-Channel up, down, cross-converter for 4K/UltraHD/2K/HD HDR transformation. In 4-Channel mode, FS-HDR offers 4 independent channels of 2K/HD HDR/WCG transformations as well as up, down, and cross conversions. 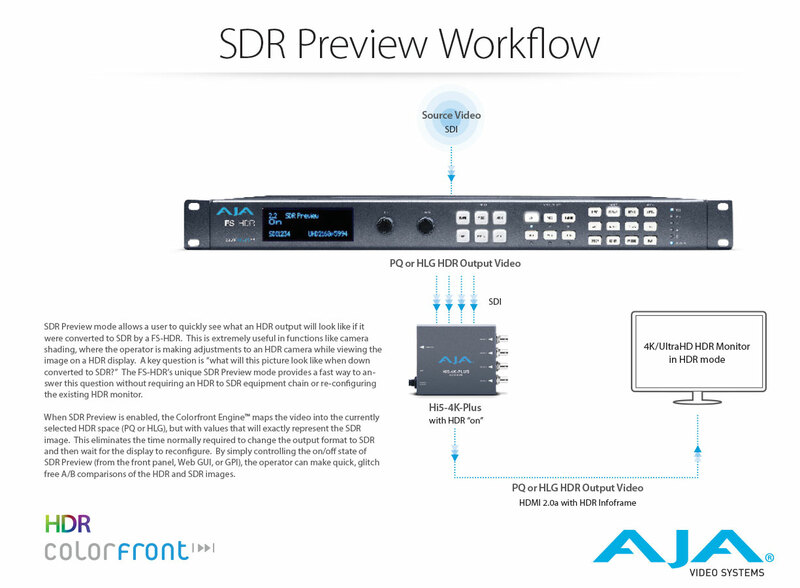 Deliver more immersive content to audiences with the power and flexibility of AJA FS-HDR. See how FS-HDR and the Colorfront Engine can simplify real time HDR/WCG transformations, and makes it easy to maintain the look you’ve worked to achieve across SDR to HDR, HDR to HDR and HDR to SDR for both 4K and HD needs. Learn more about the device’s extensive capabilities, including extensive camera log translations and more. Colorfront Engine Live mode provides conversions and controls that support live applications such as broadcast, OTT, A/V, and venue. Colorfront Engine Film mode provides conversions and controls, including ASC CDL, for applications such as on-set camera preview and look creation. 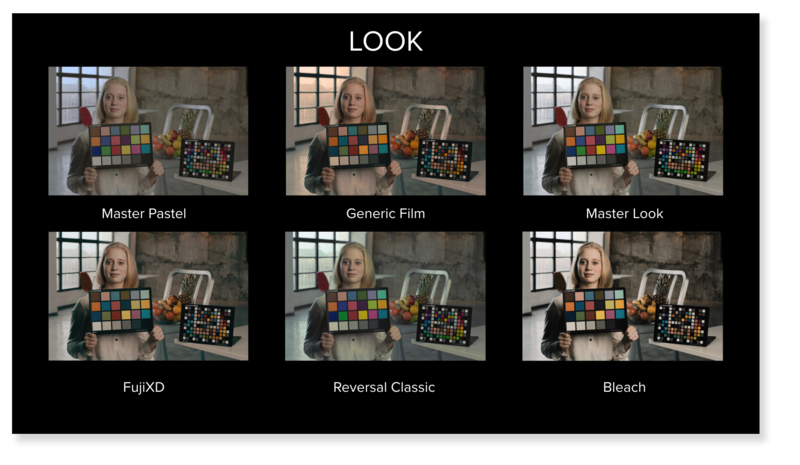 The Academy Color Encoding System (ACES) is becoming an industry standard for managing color throughout the life cycle of a motion picture or television production. From capture through editing, VFX, mastering, public presentation, archiving and future remastering, ACES ensures a consistent color experience that preserves the creative vision. FS-HDR v3.0 adds an ACES Grading Colorspace and offers ACEScct Input and Output Dynamic Ranges for realtime integration with ACES workflows. FS-HDR provides parametric controls for Colorfront Engine’s HDR transforms and color correction in both Live and Film modes. Each parametric control is accessible via FS-HDR’s front panel, the web GUI on any browser, or REST interface, and settings can be stored to a preset for recall later or copied to other FS-HDR units. FS-HDR supports uploads of user created 3D LUTs (33 point .cube format), with the ability to store and recall as needed through the FS-HDR's simple visual GUI. This is ideal for bringing a standard desired look to a production, applying a creative LUT previously designed for the sake of the project or potentially loading a film emulation LUT for a particular look. FS-HDR also supports Dynamic LUT uploads from 3rd party software for live playout, with the ability to see changes as you implement them. Single-Channel Dynamic LUTs support 4K resolutions, and v3.0 brings new support for Multi-Channel HD workflows, with integration support for TVLogic’s WonderLookPro and Pomfort’s LiveGrade Pro for continuous real-time LUT updates as grading is performed in third party software. Converting SDR sources to HDR for integrating into an HDR program. Converting HD SDR BT.709 sources to UltraHD HDR BT.2020. Converting UltraHD HDR BT.2020 sources to HD SDR BT.709. 4K/UltraHD Conversion Power with simultaneous 2K/HD outputs. 4K/UltraHD delivery, processing and synchronization is fast becoming the next standard, and FS-HDR gets you there with a wealth of digital video connectivity including Quad 1.5G, Dual 3G, Quad 3G with built in BNC connectors and 12G/6G over optional 12G-SDI HD-BNC and 12G-SDI LC Fiber SFP modules. In single channel mode, FS-HDR will scale up your HD or SD materials to 4K/UltraHD and back, with a huge array of audio channels over Fiber, 3G-SDI, AES, and MADI for an incredible 272 x 208 matrix of audio possibilities. In Single Channel Mode, HDR processing can be performed on true 4K or UltraHD signals and up, down, cross-conversion is available for HD HDR or HDR SDR needs from an UltraHD source. The channel can be configured for Colorfront Engine Live mode, Colorfront Engine Film mode, BBC HLG 3D LUTs, User 3D LUTs, or Dynamic LUT mode to accomplish the desired HDR transform. 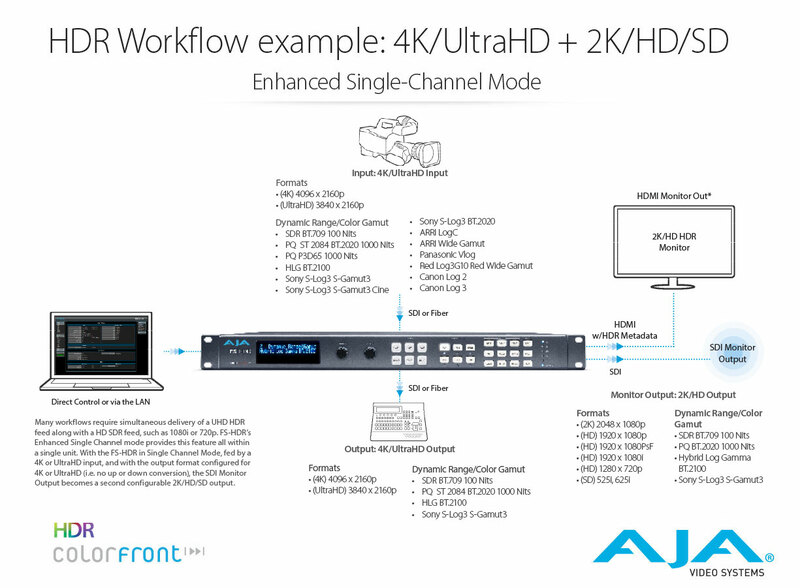 Enhanced Single Channel Mode offers simultaneous 4K/UltraHD and 2K/HD outputs for Single Master HDR workflows. In Four Channel Mode FS-HDR provides incredibly powerful multi-channel conversion with up to four channels of simultaneous HDR processing for 2K/HD and SD signals. Powerful conversion processing also allows Region of Interest (ROI) scaling, color correction, proc amp controls, motion adaptive deinterlacing and much more. Each channel can be independently configured for Colorfront Engine Live mode, Colorfront Engine Film mode, BBC HLG 3D LUTs, User 3D LUTs, or Dynamic LUT mode to accomplish the desired HDR transform. In Four Channel Mode you can also bring in a single HD source and process four separate outputs from it, each with their own HDR/SDR transformations. FS-HDR utilizes standard BNC as well as optional SFP inputs and outputs to integrate easily into a variety of workflows and facilities with support for SDI workflows all the way up to 12G. FS-HDR has Coax and Fiber* inputs and outputs to accept 4K/UltraHD/2K/HD/SD resolution SDI signals in Single Channel Mode. In Four Channel Mode 2K/HD/SD inputs can be routed to multiple locations simultaneously without the need for any external signal distribution. A looping Reference Input allows the FS-HDR to be locked to your house reference signal for rock solid stability. Moving to 4K is never an instant change. Legacy signals and archival material need to be integrated into the 4K environment while 4K/UltraHD sources need to be down-converted for current 2K/HD pipelines. 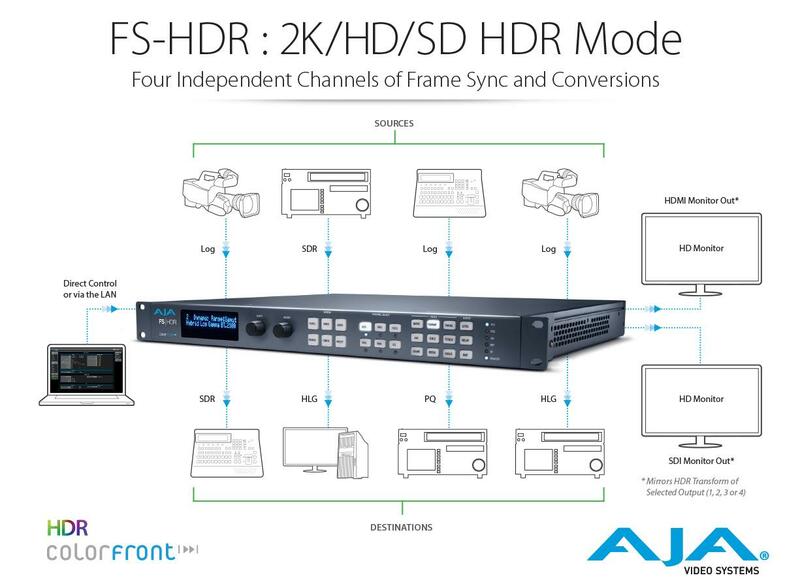 Utilizing AJA's remarkable conversion algorithms, FS-HDR supports up, down, cross-conversion from 2K/HD/SD to 4K or UltraHD video and back over 12G/6G/3G-SDI video. Both Square Division (SQD) and Two Sample Interleave (2SI) pixel mapping formats are supported. FS-HDR's SFP options include both 12G/6G-SDI HD-BNC and Fiber LC I/O options including single and dual channel Single-Mode options and Multi-Mode options, allowing great SDI flexibility and fiber cable runs of up to 10 kilometers to be connected directly to the FS-HDR without the need for separate fiber to SDI conversion. The Tangent Element Kb twelve knob panel provides remote real time adjustment control of the FS-HDR’s Colorfront Engine parameters for HDR. This enables quick access and tactile control for key FS-HDR parameters in live production. A free standalone app, FS-HDR Control Link, can be run on a local PC or Mac to provide communications between the Tangent panel’s USB interface and an Ethernet LAN, and ultimately connect to the FS-HDR. With v2.6 firmware and above and FS-HDR Control Link software, you can control parameters across multiple FS-HDRs and utilize 4x FS-HDRs simultaneously for 8K needs. Control Link software can be found alongside the FS-HDR firmware under the Software panel on FS-HDR's Support page and instructions for use are included in the FS-HDR manual. Note: The Tangent Elelment Kb hardware is not sold through AJA and must be sourced through normal third party channels. FS-HDR is network ready and supports SNMP monitoring and web-based remote control. Units can be connected to any Ethernet network via the built-in 10/100/1000MB Ethernet port, allowing control and configuration of multiple FS units from any web browser on a connected computer. Configurations can be saved and applied to multiple units, ensuring consistency and quick configuration in large installs. FS-HDR features unique over the network control of HDR settings from within its elegant interface available from any browser, anywhere. FS-HDR includes an HDMI 1.4 output mode for 2K/HD monitoring of your HDR conversions. FS-HDR provides HDR infoframe generation to support HDR displays per HDMI v2.0b/CTA-861-G. The Monitor outputs (SDI and HDMI) support 2K/HD/SD formats, so when monitoring a 4K or UltraHD output, the monitor outputs (both SDI and HDMI) will be automatically down-converted to 2K or HD with HDR transforms respectively. For full HDMI 2.0 to 4K/UltraHD displays, pair your FS-HDR with either an AJA Hi5-12G for 12G-SDI 4K/UltraHD or a Hi5-4K-Plus Mini-Converter for Quad 3G-SDI. AJA’s Hi5-12G preserves your vision with pristine image fidelity and HFR support up to 60p for 4K/UltraHD 12G-SDI to HDMI 2.0 conversion needs. Both the Hi5-12G and Hi5-4K-Plus can generate HDR metadata in accordance with HDMI v2.0b/CTA-861-G.
Hi5-4K-Plus provides a simple monitoring connection from professional 4K devices like the FS-HDR, using Quad 3G-SDI, Quad 1.5G-SDI, or Dual 3G-SDI outputs to new displays with 4K/UltraHD HDMI 2.0 inputs, for cost effective monitoring for 4:2:2/4:4:4 60p professional workflows. The growth of 5.1 and 7.1 audio has increased the number of audio channels that must be managed in a production, The MADI standard provides a convenient way to transport huge numbers of audio channels along a single cable, simplifying the cabling demands for broadcasters, mobile trucks and production. FS-HDR supports both fiber and coax MADI input and output. An internal 277 x 208 mono audio matrix allows you to route 1 to 1 or 1 to many with full routing of MADI, mixdowns and all audio coming from SDI, fiber and AES sources for an incredible amount of audio processing capability in a single box. FS-HDR supports closed captioning and the conversion of closed captioning between 2K/HD/SD and 4K/UltraHD formats - including full conversion of CEA-608 and CEA-708 standards. FS-HDR can preserve closed captioning even when converting between formats, removing the need to reinsert closed captions after conversion. Watch this video to learn how to configure FS-HDR utilizing the FS-HDR’s built in web interface for both 4K/UltraHD, and multi-channel HD HDR to HDR, SDR to HDR and HDR to SDR needs. AJA’s technical support is recognized as among the best in the industry and is available to all AJA customers. If you need assistance with any aspect of your FS installation, configuration, operation or encounter any technical issue, AJA Support will work with you to get up and running. FS products are covered by a generous five year international warranty.